Planning a festive night out? How about a unique night UP instead? 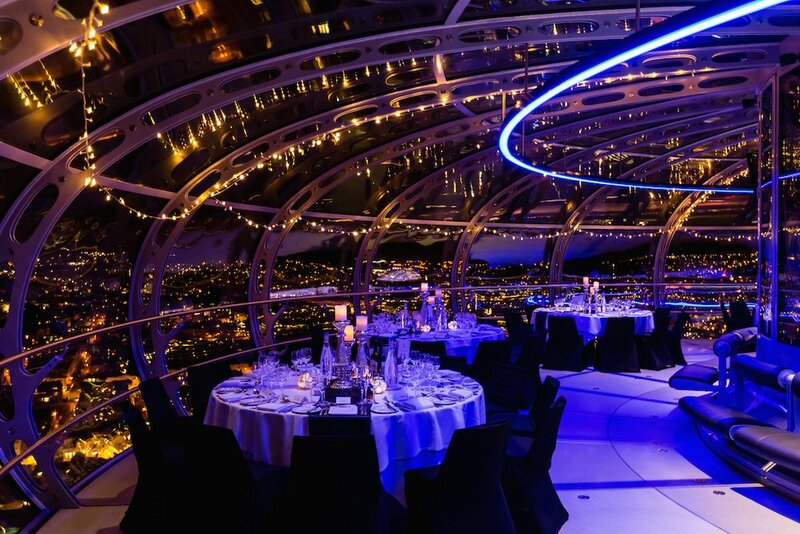 If you’ve a Christmas party to book or are looking for a unique gift, consider getting high – legally – with a BAi360’s sky dining experience. 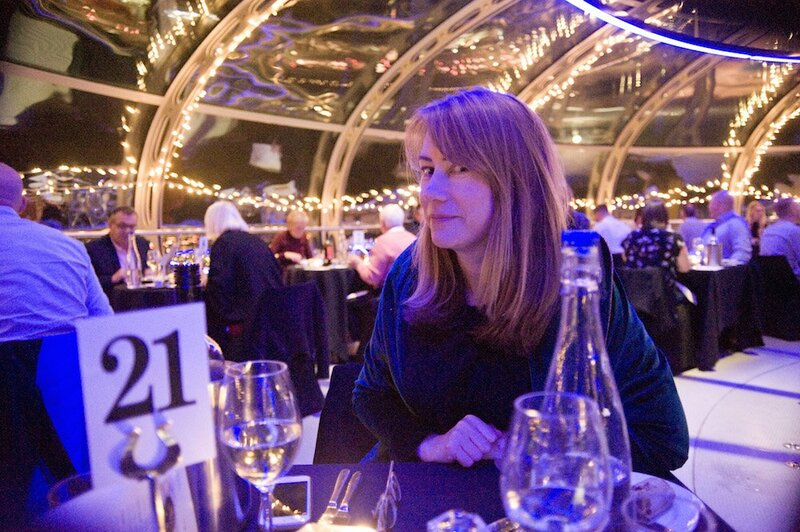 I joined one of the evening dining ‘flights’, which take place monthly, and was impressed how much of an atmosphere had been created within the pod in what is, after all, a rather industrial-looking space. There were fairy lights along the metal beams and mood lighting (though it’s not so great when the food comes bathed in blueish light). The tables had tablecloths and imitation candles. There was also music, starting with and popular crooners and swing classics. Sinatra’s ‘Come Fly With Me’ kicked things off and that wasn’t the only song with a flight or sky-related connection during the evening, so it became a bit of a guessing game as to what was coming up. Boarding as a regular flight you rise to eat at the top overlooking the city, coming down between courses, so, yes, you can go to the loo. 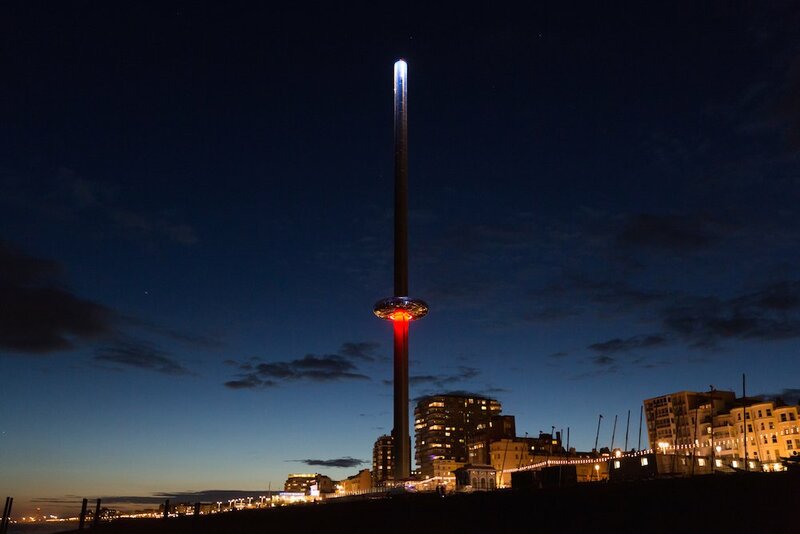 I hadn’t been on an i360 night flight before and enjoyed seeing the lights twinkling below – after all, cities usually look better at night. Most people had dressed up a bit and it was fun to be in our party-decked pod dipping down past dog walkers at street level to break between courses before rising up above the city lights once more. It’s a three course affair and starters, main and dessert are loaded separately for each of the three flights. The food, handled by an outside company, was fine but distinctly unexciting, and it felt very much like corporate catering, giving me conference flashbacks. I had a mackerel starter and a main of chicken with fondant potato, kale and root vegetables. My husband had the vegetarian option of celeriac steak, which was original at least. There were also dairy free and gluten free options. 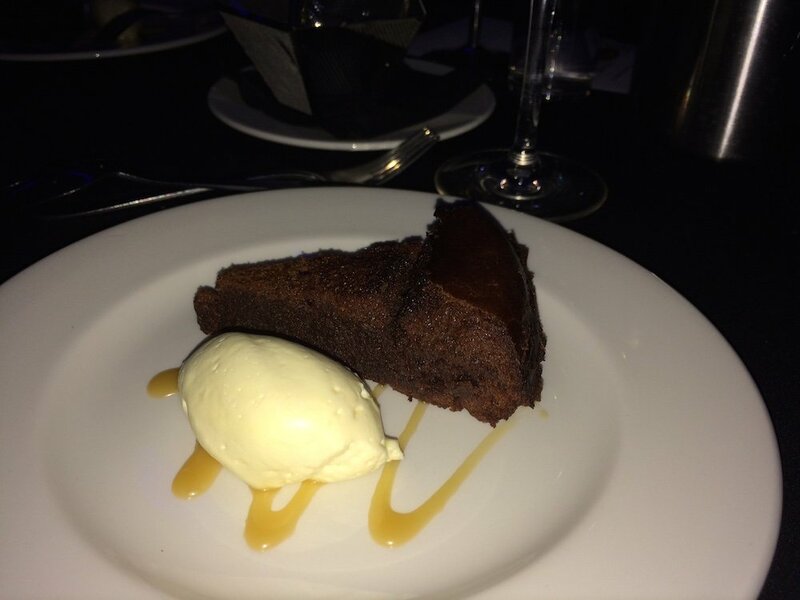 The best course was a chocolate torte with orange cream, which was followed by coffee. 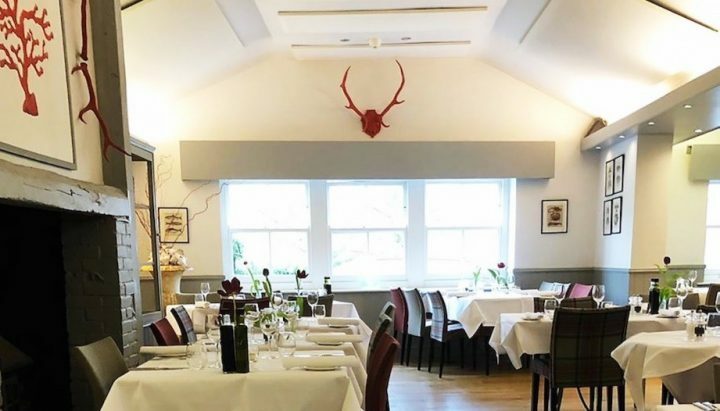 There is a difficulty, naturally, getting things from the kitchen and served in the pod in the same way as a restaurant but I would have expected, for the price, something more special and more substantial. A simple extra course or two, maybe canapes at ground level on arrival, cheese or petit fours after the coffee would have helped. 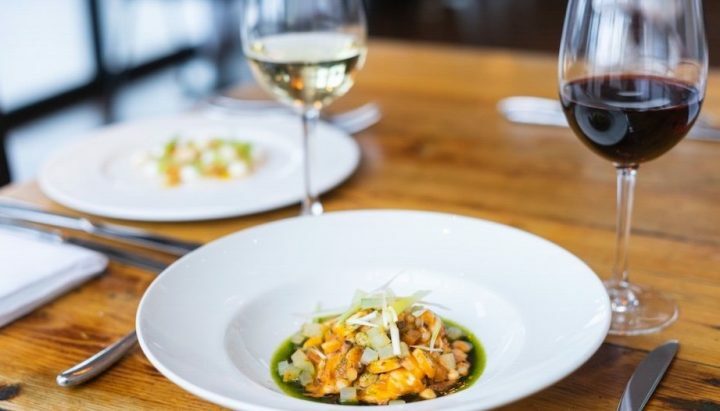 It’s a great concept and it would be good to see the food aspect evolve and particularly great to have some local chefs getting creative with pop-ups. It’s worth noting you’re paying for three lengthy flights and a relatively exclusive space and the price – £90 – is comparable to the long-running Bateaux dinner cruise in London. You get half a bottle of wine with the meal (i.e a bottle between two) and our white went down well. You can order more from the bar. The service was also good and I noticed the circular shape of the pod helped, with serving staff stationed near the middle able to see several tables at once. The seating, when the pod is full, is in two circular rows. I was on the inside layer, could see reasonably well and could wander to look out of a window between tables when people weren’t eating but if you want to ensure a window spot, especially if you haven’t flown on the i360 before, it’s best to check if one is possible on booking. As dinner progressed the music got more mainstream pop and a bit more hit and miss to my taste (I could have done without Steps telling me to reach for the stars). There were mostly couples on my night which is why the low key music at the start felt more suitable but I can see how it would be easy to create a good party atmosphere for groups. 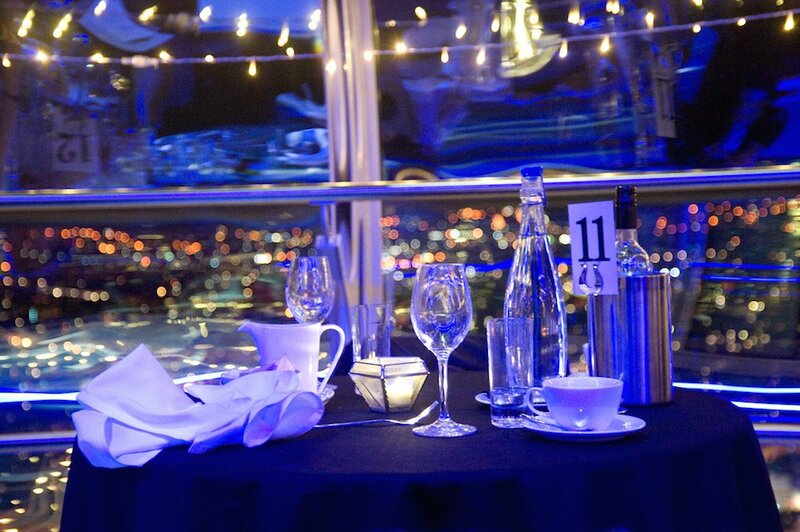 You can book a table of up to ten for the sky dining experience. The pod can also, of course, be hired out by one group exclusively. 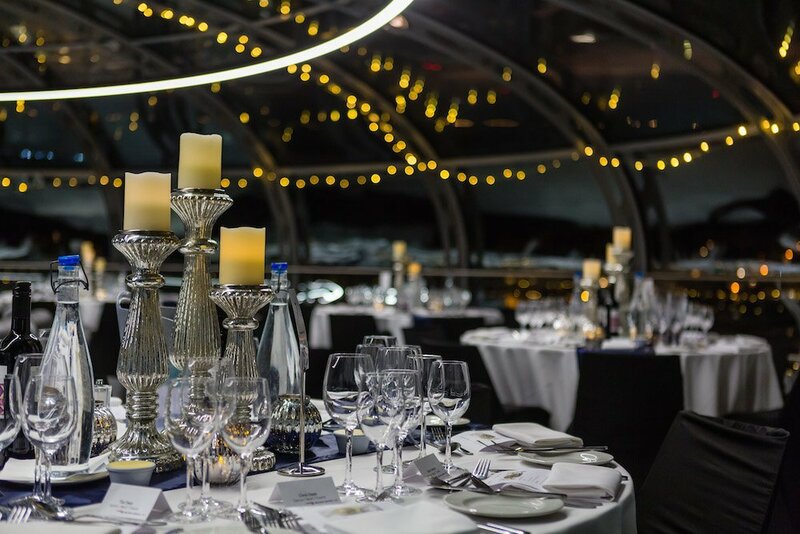 The whole experience of eating in the night sky had a sense of occasion and I’d think it would really come into its own if the dinner itself was a secondary consideration, on a works bash or a party night with friends, and can imagine with more groups onboard it would be a lively night. 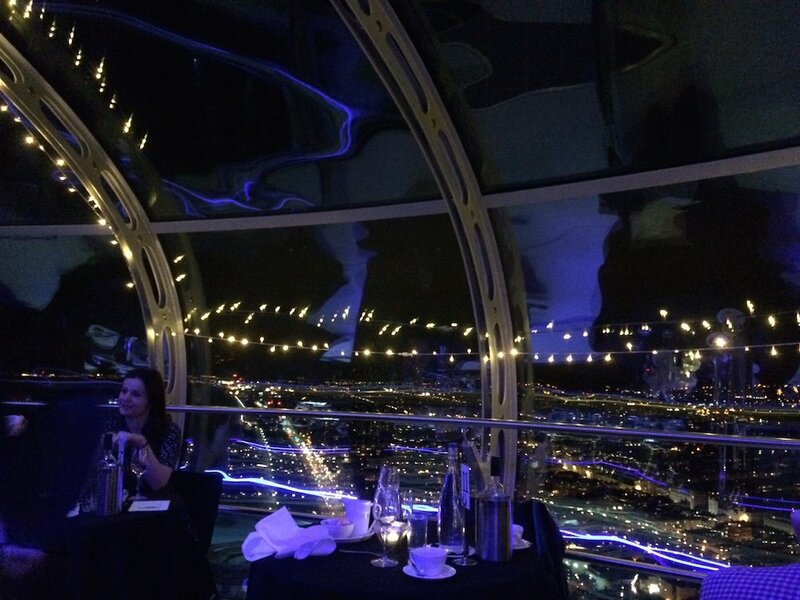 For dining as a couple or family I think it would work best for out-of-towners for whom the BAi360 is still a novelty. In months when it gets dark less quickly you’d have the romantic bonus of sunset followed by twilight up in the pod. Good for: A novel experience. A Christmas party (especially if your boss is paying!) Treating a relative from out of town for a special occasion. Disabled access – wheelchairs are fine. Getting creative with the set up and planning your own bash. 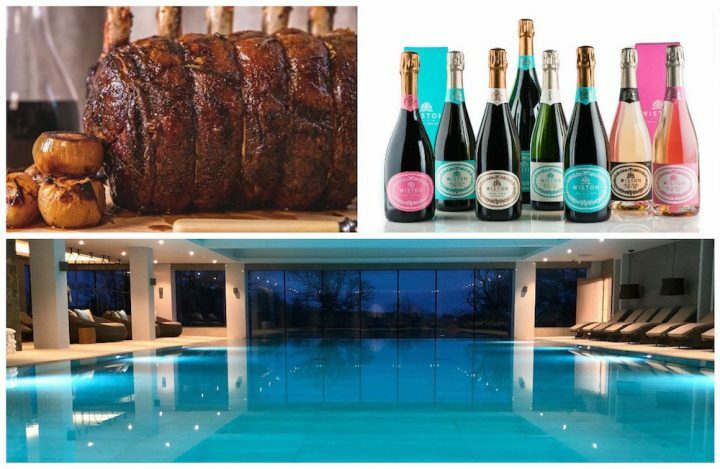 ££ The next Sky Dining experience is a Christmas edition with a three course seasonal menu, half a bottle of wine and coffee for £90 on 22 Dec.